The other day I was walking around Brick Lane when my eye caught sight of this poster. 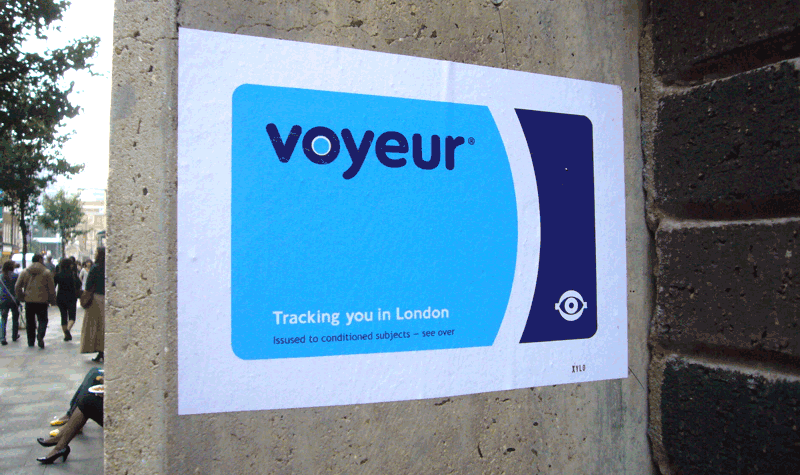 As a frequent traveller on the network of public transport, the graphic language is immediately recognisable as the artist has appropriated Transport for London’s ‘Oyster’ card. This card, introduced first in 2003 is designed to reduce the number of cash transactions at ticket offices and the number of single paper tickets sold on the London transport network. From a design perspective one could say that it is a good substitute for paper, reducing the amounts of paper tickets. However, this is only partially true (e.g. the cards cannot be used for 1-day Travel cards and it cannot be used on a number of National Rail Services). There also other issues that the implementation of this card system has lead to. Yet, what this poster highlights, is the right to privacy. The technology used for the oyster card is known as Radio-frequency identification (RFID). This means that the cards transmit information (personal details) whenever they come into range of a reader. This system therefore enables to track the movements of the travellers (10 million or so). We can now be tracked and traced should we come under scrutiny. It is said that the police have used Oyster card data as an investigative tool in tracking people in ‘terrorism’ cases. This poster brings to mind the paradox of control and liberty. What I found interesting is how this type of ironic street art, as guerrilla campaign, reminds us to ask ourselves if “Big Brother” is watching us? And, how do we feel about that?